Last Sundays party was a killer mix of people, music and vibe and we will be building from here with surprise guest djs and treats for our scenesters. 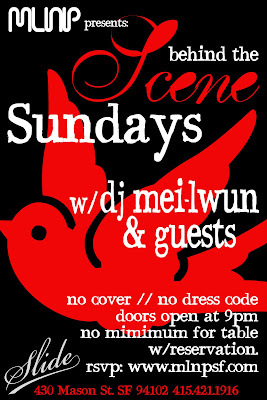 Check "SCENE" Sundays July 5th @ Slide. Join MLNP for a casual take on San Francisco's finest venue and kick it behind the scene. No Dress code, No Cover and No minimum for table with your reservation. Email MLNPSF@GMAIL.COM for your free reservation and join the MLNP VIP list http://www.mlnpsf.com.